Lan Speed Test is a free and commercial software program for Microsoft Windows and Apple Mac OS X devices that assists users and system administrators in testing the speed of the local area network. Network administrators and home network users may want to check the speed of the local area network when the set it up, and whenever networking parameters change. One reason for running tests is to make sure that performance and stability of the connection is optimal. A speed test can assist network admins in finding devices or configurations that slow down the performance, or impact the operation in other ways. 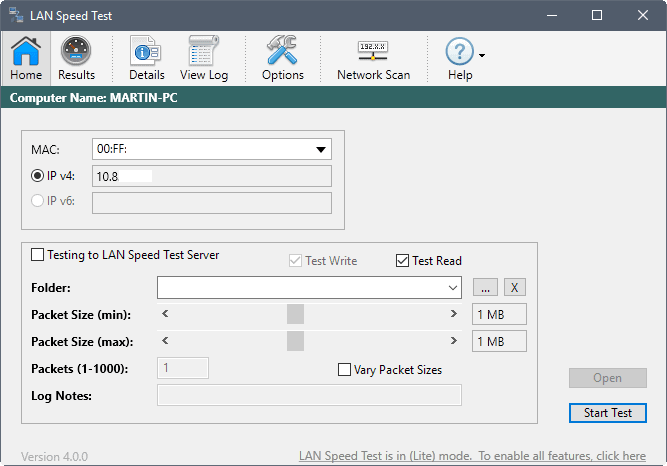 LAN Speed Test is a portable software program to test the speed of a local area network. The program is available as a free lite version, and as a commercial and server version. The lite version supports the bulk of features but lacks support for some advanced or business-orientated features such as logging of results, continous mode, network scans, or support for multiple packets. The program displays the name of the computer it is run on, and the Mac address and IPv4 or IPv6 address on start. You can hit the test button right away if you want to test using default parameters. You may however change test parameters prior to running the test. You can modify the minimum and maximum packet size for instance, and if you are a commercial user, the number of packets on top of that. LAN Speed Test displays the upload and download speed afterwards, and various bits of data like the time per packet or the bits per second for each. Note that you need to select a folder on another computer for the test to be effective. Since you want to use the program to test the network speed, it is necessary that data is transferred over the network during the test. LAN Speed Test writes data to the larget location, clears the Windows file cache, reads the data that it wrote before, clears the cache again, and deletes the file during the test. Commercial users may access other features the program provides. The network scan option runs a scan for devices in the network for instance, and lists all that are found. The options are mostly disabled for lite users. While you can change the default display of results, and some other parameters, options to log results, run multiple tests, or use email notifications are not supported in that version. 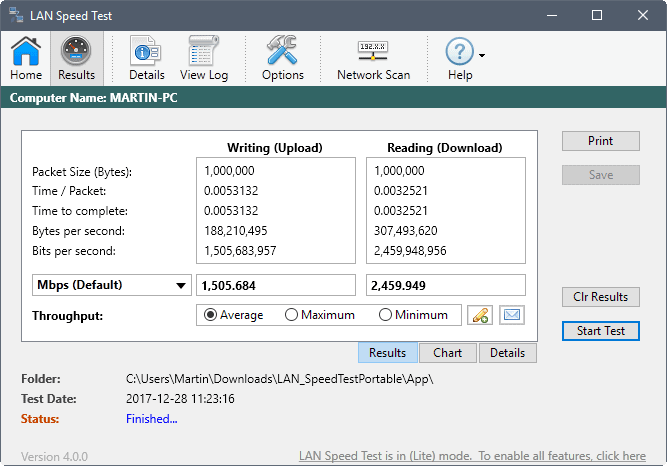 LAN Speed Test is a powerful networking software for Windows and Mac devices. The free version is quite powerful on its own, but it lacks features that businesses and professional administrators may require. The proce of $10 per unit is quite reasonable however. Interesting one. There are surprisingly few tools that measure LAN speeds, and it’s even harder to do it unobtrusively. I ended up with scary mashup of remote console and iperf for my needs. Will try this one, curious if it will work with admin shares for target.